Also known as the Tahiti lime, the Persian lime tree (Citrus latifolia Tan) is a vigorously growing, medium-sized tree. Capable of growing to 20 feet, the Persian lime is a hybrid of the Mexican lime and citron trees. The Persian lime prefers to grow in USDA hardiness zones 8 through 11, where the winter temperatures do not fall below 10 degrees F. Care of the Persian lime tree is minimal once established, provided it is planted in well-drained, sunny soil with a pH between 6.1 and 7.8. Water the Persian lime tree on a regular basis using a soaker hose. Provide the tree with supplemental waterings every three to four days if recently planted; otherwise, deep waterings every seven to 10 days should suffice. Keep the soil moist, not wet, to a 1-inch depth at all times. Pull weeds by hand when they appear under the canopy of the lime tree. A 3- to 4-inch layer of mulch spread under the Persian lime tree will also help reduce weed growth. Mulching also improves drainage and protects the roots from the heat of the afternoon sun. Feed the Persian lime tree a diet of 21-0-0 fertilizer. A high-nitrogen fertilizer will encourage growth, especially if applied in early spring before new growth develops. Check the package labeling for application recommendations and frequency. Remove dead or damaged branches during the winter. Use a pruning saw or pair of pruning shears to remove the branches. Inward growing branches also require pruning during this time. Harvest the limes when they ripen. The most productive time for most Persian lime trees is between the months of July and September. The Persian lime is ripe when it turns yellow. Use straw, pine needles or bark chips for mulch. Spread mulch at least 6 inches away from the bark of the tree to prevent pest infestations. Keep blankets or sheets on hand. The Persian lime tree will require a loose draping of blankets to keep it warm in the case of an unexpected frost. Consult a professional arborist if your Persian lime becomes afflicted with pests or disease. An arborist can diagnose the tree and determine the best solution for its recovery. The sooner you seek consultation, the better your tree’s chances. 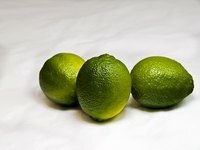 A green lime will not ripen or turn yellow once picked. Leave the limes on the tree until they turn yellow to ensure ripening.